Set in Prohibition era New York with rival gangsters Fat Sam and Dandy Dan at logger heads. 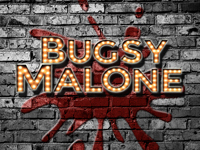 As custard pies fly and Dan’s destructive 'splurge guns' wreak havoc, Bugsy Malone, a penniless ex-boxer and all round nice guy, falls for Blousey Brown, an aspiring singer. Will Bugsy be able to resist seductive songstress Tallulah, Fat Sam's moll and Bugsy's old flame, and stay out of trouble while helping Fat Sam to defend his business? Featuring all the classic songs from Oscar-winning writer Paul Williams including Bad Guys, My Name is Tallulah and So You Wanna Be a Boxer.